The Loch: A Scottish Fishing RPG is a role-playing game set in a loch in the Scottish Highlands, and was developed in August 2013. The Loch is available via itch.io! 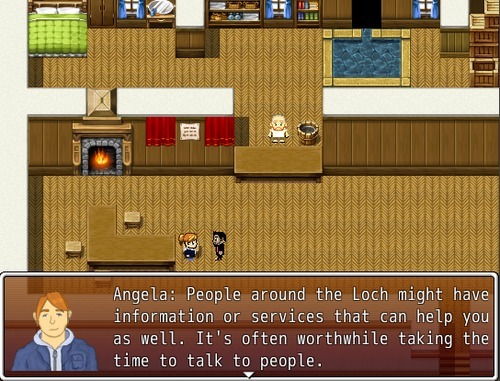 The player takes on the role of Angela, an angler who has come to fish in Loch Saor, in the Scottish Highlands; the player must guide Angela around Loch Saor as she tries to catch at least one of each type of fish in the areas surrounding the loch; along the way, she meets a number of the loch's residents, stumbles upon mysteries, and makes friends with other anglers. 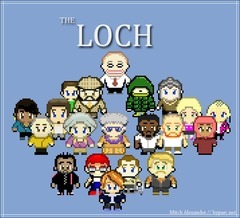 There are a total of five playable characters in The Loch; unlike most Japanese-style RPGs, only one character may be controlled at any one time. The player begins the game with Angela, but, after finding each other character in their respective area of Loch Saor, they can then switch to play another character by returning to the Fishing Club. 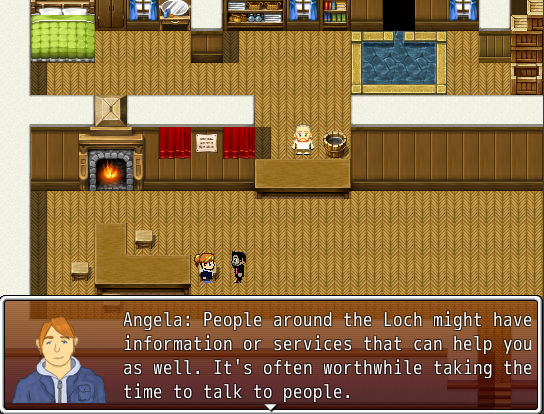 Angela, the main character of the game; a fly-fishing angler who has come to Loch Saor to go fishing, exploring, and to make new friends. Blair, a fisher looking to go professional and outspoken about the stigma she faces as a young woman in a sport dominated by older men. Campbell, an older man exploring the rumours, ruins and historical sites around the loch. Gregor, a ex-army veteran interested in making fishing around the Loch more accessible to people. Ravinder, a former college student who comes to the Loch to clear his mind and get away from the stresses of city life, looking to be tutored in angling. Angus and Drew, a fisherman who makes fly-fishing lures for the player, and his son. McClellan and Navid, described as "Loch Saor's power couple", who run the Fishing Club and Pub respectively. Shrijani, a marine biologist with knowledge about most of the fish in the Loch. Stephen, a ghillie who provides extensive details about the Loch and the surrounding areas as a profession. The Visitor, who only appears in the pub on rainy days to share rumours about mysterious events around the loch. 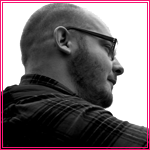 The Loch began as a small solo project in RPG Maker VX Ace Lite for Sophie Houlden's 7-Day Fishing Game Jam, which was held on the 20th to the 27th of May 2013 - the theme was "fishing", which could be interpreted as literally or figuratively as anyone wanted to. Since I was looking for an excuse to make games over the summer between semesters at uni, I decided to take part! …and that's despite the fact that closest I've ever come to actual fishing was in the form of a small box that my older brother owned: a green plastic container which might once have been a First Aid kit. Inside was a number of cone-shaped weights made of metal, or stone, and a tangled mix of lures and hooks - my favourite piece in the box was an orange squid with wiggly plastic tentacles, which I've since discovered is a lure skirt, a piece added to a lure to make it seem more alive (and thus more attractive to fish). The box had an esoteric quality to it, a secret treasure from a bygone age where each individual piece had a very specific purpose that was totally occult to me. The rest of my fishing knowledge comes from an anecdote of my mum's that, when I was four or five, she saw me sitting on the edge of the pier of my hometown with a fishing rod made of bits I'd found lying around, including a metal chain and some twine from a fishing net, angling for those most elusive of fish, "splats". I can assure everyone that I used every piece of fishing wisdom I possibly could from this entirely anecdotal account that I have no memory of ever experiencing in the development of The Loch. I only had the vaguest of intentions when I began working on the game that would become The Loch at the start of the 7-Day Fishing Game Jam. I'd just finished playing Yume Nikki, and I had some lofty intentions of making a game where the player character could fish from atop a cloud, under an abandoned oil rig, inside an ancient catacomb, inside their own dreams, etc, etc. 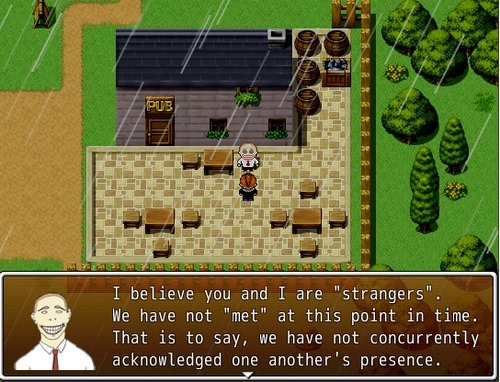 I only had a week, though, and there was only so much I could do while getting to grips with RPG Maker for the first time. I decided I'd map out the levels of the game using the basic RPG Maker tilesets, and if I found time later, I'd have a go at making some assets for areas that are a little more out-there. Over the course of the week, I kept a development diary on the Fishing Game Jam forum, with some daily updates on the progress of The Loch; and, by Sunday, I'd made a playable version of the game available. As with most projects - especially games projects - there were a lot of features that had to be dropped to make the cut-off point, a number of systems that had to be simplified so that they were even marginally usable, and a number of art assets that were unfinished or entirely missing from the version of the game released on Sunday. And, by that point, I'd realised I desperately wanted to keep going. After the weeklong game jam was over, The Loch just continued to expand in a way that I like to describe as "feature bloom" - it's like feature creep, but nice! Over the course of the next couple of months, I managed to get a lot done, including adding (and creating portraits and sprites) for 5 player characters and 15 non-player characters, 19 individual fish, and a fishing system with four different types of tackle, plus lots of little extras for those people who like to explore. When I'm designing games, I tend to keep in mind the categories of "The Bartle Test", a system that classifies players based on whether they're Achievers (who want a sense of accomplishment and concrete goals to complete), Killers (folk who like to make stuff dead), Socialisers (who like to talk, chat, roleplay and the like), and Explorers (who enjoy grokking the system, the environment, and so on). Although the Bartle Test is generally used for MMOs, I've found it's a pretty useful design system for single-player games as well. 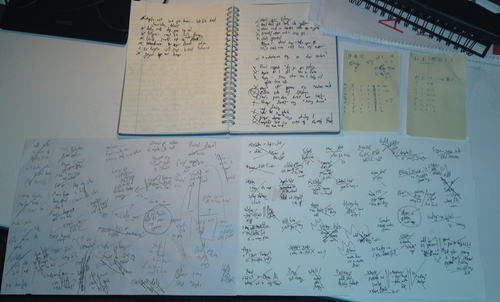 Eventually, the "feature bloom" was rapidly becoming "feature creep" - I'd started considering adding in secret areas, additional characters and special events that were a fair bit removed from the original vision of the game - the thing that put the brakes on it was when I went to make a new level for the game, and was told that I'd reached the maximum number of levels for one project - the Lite version of RPG Maker VX Ace has caps placed on a lot of different elements of the game, including the amount of enemies you can create in one game (or in my case, fish), the amount of characters you can have, the amount of "common events" you can use, and so on. Up 'til this point, I'd managed to create workarounds for some of these limitations, but by that point I realised it was time to stop creating new things, and to polish what I already had. Testing took up a fair amount of time; a lot of that was down to playing through the game at various points, to see any common problems that might show up on the average playthrough, scribbling down when they cropped up (alongside a possible diagnosis for why they appeared), and then continuing with the playthrough, provided they weren't significantly game-altering. Then, I'd go through each, one-by-one, and cross them off as they were fixed. 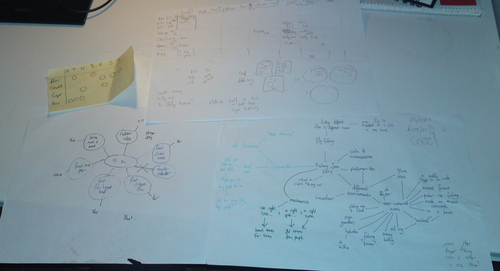 Other times - such as after implementing a big new system, like adding in a new type of fishing tackle, new playable character, or a new sequence of events - I'd have to carefully design a way to test that system in isolation (for internal errors), and then how that system worked with any system that it interacts with (for external errors), which often meant adding in new events, new start points, and adjusting lots of variables just to simulate as though I'd been through certain parts of the game. Once I'd done all of my own playtesting, I set up the Facebook group and let other folk playtest that version of the game - which turned out to be a massive help, because not only where there errors I'd completely missed, but there were errors that had been created because of things I changed so I could playtest the game myself! As is often the case, there are a lot of things I'd like to improve, include, or modify, but time is always an issue. The Loch almost exclusively uses the default RPG Maker VX Ace Lite tilesets - I'd initially wanted to make my own tilesets for the game, simply to distinguish them from other games made with RPG Maker, but, for the sake of actually finishing the game before mid-August, I decided to set that aside - which was ultimately for the best, considering most of the sprites I'd drawn were either overly-simple or overly-complex! I'd also have liked to include more distinct audio. I had the benefit of finding inchadney on the Free Sound Project, who has a girthy library of sound assets that were recorded in Scotland, including Scottish birdsong, which helped make the environment feel more like Scotland (and made it recognisable to Scottish people as well). However, I'd've liked to include Scottish ambient music - but, as ever, time was a factor, and it would take a lot of it to source a Scottish recording artist or two with free, open-source music, which could easily be looped, then implement it into the game at the appropriate points. The ambient background sounds of birdsong, waves, wind and rain were enough, I think, to put across the feeling of being by the side of a loch in Scotland. All in all, I'm incredibly pleased with how The Loch turned out - I've gotten good feedback on it thus far, and I managed to include a lot of the systems and mechanisms that I felt the game required. It also meant that I could finally create a game that was distinctly set in a Scottish location, which, as a Scottish game designer who's also pro-Independence, was pretty close to my heart. The Loch definitely feels like a major success for me, and I hope at least some of the positivity I got from it comes across for all the folk who play it too!